The four synagogues of Trani were converted into churches during the wave of anti-Judaism that followed the fall of Apulia to the Kingdom of Naples. Three hundred of the Jews remaining in the city were forced to convert to Christianity. The four synagogues were renamed Santa Maria in Scolanova, San Leonardo Abate, San Pietro Martire, and Santi Quirico e Giovita (since renamed Sant’Anna). San Pietro was later demolished and there are few remains from the original buildings of San Leonardo and St.Anna. 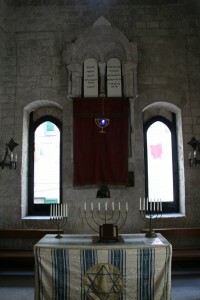 The Scola Nova synagogue was returned to the Jewish Community of Trani in 2005 and is today the oldest functioning synagogue in Europe. The rectangular masonry building has a Gothic structure 49 x 21 feet with a barrel-vaulted ceiling that measures 36 feet high. 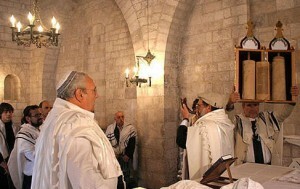 Three windows are placed on the eastern wall, one on each side of the Torah Ark, and one above it. The cut-stone surrounding the Torah Ark still exists. The ark was once accessible through a seven step stairway. It featured a central column that divided two separate arched openings. The building next door once contained the synagogue’s women’s gallery (matroneo) and, in the basement, the pool of the medieval mikveh, which survives. An oil painting of St. Mary hangs in the niche that once held the Torah Ark. The Church and the Historical Superintendence did not grant permission for the painting’s removal. As a compromise, the painting of the Madonna is now covered with a cloth decorated with a menorah. The Scola Grande Synagogue was built during the Middle Ages and transformed into the church of St. Anna in 1380. 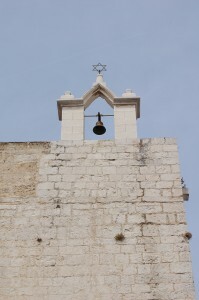 Today, it houses the Jewish section of the Diocesan Museum of Trani. A medieval plaque on the northern wall describes an early renovation of the synagogue: “In the year 5007 after the Creation, this sanctuary was built by a group of friends of the congregation, with a tall ornate dome, a window providing light and new doors for the closure; the floor re-laid and seats installed for the choir. May their piety be remembered before Him Who dwells in the splendid heavens.” The date 5007 translates to 1247 AD. The nearly square shaped Scola grande synagogue is a Byzantine-style domed masonry building, 38 x 40 feet, formed by four huge arched walls supporting a 26-foot high dome. The arch of the western wall opens into a semi-circular niche supporting an arched dome thought to have once contained the bimah. This would have been an early version of the plan later widely adopted by Sephardic synagogues, in which the bimah is on the western wall and the Ark on the eastern wall separated by the length of the room. The church was restored in 1841, in 1880 and in 1978. It features paintings of scenes from the Hebrew Bible.